Who doesn’t like to zoom around on a bike or a scooter that will create an impression? With different models, makes, and add-ons available on the market, you can customize your bike to perfection. Nowadays, Fat tire electric scooters and bikes are all the rage. Think of The Dark Knight swooshing around on his BatMobile, and you will get a picture of the immense power, drive, and perfection of that beauty. In the past couple of years, with electric scooters coming to the market, many have made the switch to this savvy, energy efficient and easy to ride option. Fat tires have also created a niche because of their durability and ease of use on uneven terrain. The wider width of the tires allows for better ground coverage and increases the rubber-to-ground contact, thus providing higher traction. Whether for using on snow-covered paths, sand or rainy streets, Fat tire electric bikes are here to stay. Now that we’ve established that Fat tire scooters have become a normal part of everyday life, how would you select the best fit from the plethora of choices available? Don’t worry, because here are our pick of the top 5 Fat tire scooters on the market. Powered by an 800W Electric wheel hub motor, and 48W, 20Ah Lithium Ion battery, this E-bike bicycle can cover a distance of up to 50 miles with one charge. The battery is charged and ready to go in 1-3 hours and the bike can be started with just a twist of the handle. The powerful Twist and Go system helps you easily achieve a speed of up to 15mph as soon as you start the bike. What sets this one apart is its DYISLAND hydraulic brakes with its 160 mm rotors which are extremely powerful and come in handy in sharp twists or turns. Manufactured by SSR motorsports, it weighs roughly 60 pounds. It is a bit heavy to handle on the turns, but otherwise provides a smooth, comfortable ride on sand, golf courses, and other soft surfaces. If you don’t mind shelling out the big bucks for an easy-to-use smooth bike that works amiably for short distances, this is for you. 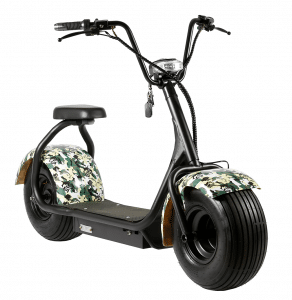 It saves gas, can work over snow, sand and uneven surfaces, and could be the perfect solution for your daily commute. This fat tire electric scooter is Phillip’s solution to smooth, quick, carefree rides. With a Throttle and Go ignition drive, 800W engine, 60V 12 Ah Lithium-Ion battery, and a sturdy steel frame, this E-bike is here to stay. The EW-08 is capable of covering up to 50 miles in a single charge and can run up to 20 mph. It’s also equipped with an Alarm system and wireless Bluetooth speaker. But here’s the icing on the cake. This Electric Scooter is a 2–seater and can comfortably carry up to 350lbs of weight on its slim and elegant frame! It also has a small LED headlight and on/off key Fob. Its hydraulic disk brakes improve traction and provide a crisp, tight grip to the ground, while its 8.5” wheel size is conducive to better balance. This 2-seater bike is a lifesaver with its fast and smooth ride and can take a load of up to 350 lb. With a lot more pros than cons, the EW-08 2-seater is recommended for its fast, smooth, powerful driving experience. With Bluetooth speakers, and at 50 miles per charge, this is indeed a decent buy! With a simple yet elegant design, the CityCoco Comfort scooter is designed for a perfect short-distance travel for single commuters. Capable of achieving a speed of 25 mph, the scooter can travel up to 75 miles in a single charge. Capable of handling up to 440lb weight, one can easily use the bike with a reasonable amount of luggage on the back. With a 1500W Hub Brushless 60V Motor powering the bike, the front hydraulic shock absorber will surely ensure a reasonably jerk-free ride. The CityCoco Comfort Fat tire electric scooter certainly has specifications that will beat most other rivals, and would be a top choice for anyone who seeks to buy an electric scooter! If you live in areas where you have to deal with frequent changes of inclines, this scooter, which supports a climbing angle of 30 degree is the perfect choice for you. 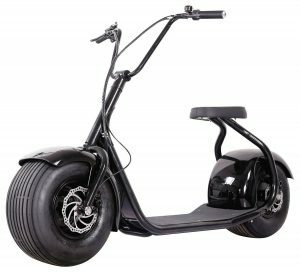 With a Twist Throttle drive, the 1000W engine-powered fat tire electric scooter is certainly a product meriting your consideration. In a single charge, you would be able to cover between 31-37 miles at a top speed of 31 mph. It would be the scooter of choice for most riders, considering it supports a loading weight up to 440lbs. 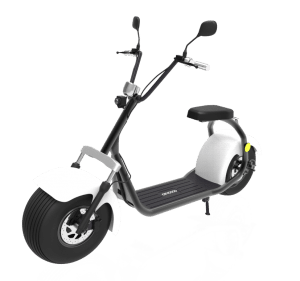 While the range per charge is certainly not the best, and you will certainly be taking a big chance if you choose to go for the scooter since it has a considerably shorter warranty period, the higher top-speed, light-weight build, and various safety features make it a product worth your consideration! This power-packed E-bike is like no other when it comes to performance. 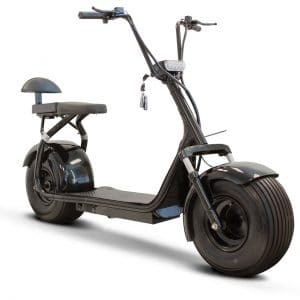 With an impressive 2000W motor and a 60V 12, 20 and 30 amp battery, this cute looking beast can go for up to 20, 40, or even 65 miles per charge. The charge time varies at 1-3 hours, 3-5 hours, and 5-7 hours respectively. Strong hydraulic systems assure a safe ride and smooth turns. Inbuilt alarm system, fast speeds, rear and side view mirrors, as well as break and turn lights – this is a complete conventional bike package in the body of a Fat tire Electric bike. 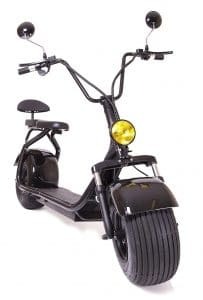 This moped by Harley is sure to turn heads when you go riding along on its steel frame and super wide tires. With a weight capacity of up to 350lbs, it can be a convenient mode of transportation. If you’re looking for a powerful ride, with maximum speed and efficiency, then this is for you. However, as it is expensive, it would make sense to evaluate if you indeed need such a high-power bike for your daily commuting purposes. All of the 5 bikes above are each proficient in their own way. They all work on the idea of combining convenience with efficiency and speed. Fat tire electric bikes have become a popular choice for most people as they are quickly replacing cars and high power motorbikes as the preferred option for a daily commute. With different companies coming out with more and more revised editions and innovative versions of their products, all that’s left for you is to go and pick the bike of your choice. Use our reviews to compare the best e-bikes, and match them with your needs and budget, and voila, you’ll be the proud owner of an E-bike soon!